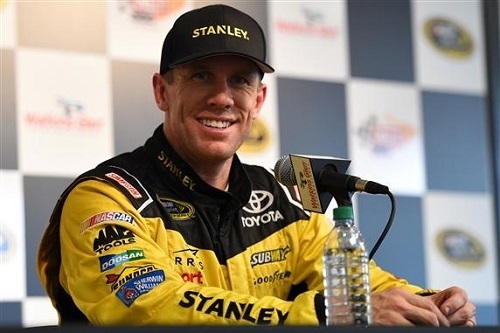 Carl Edwards’ 69.689-second/126.562 mph lap with about a minute remaining in the second of two rounds of NASCAR Sprint Cup Series qualifying at Watkins Glen (N.Y.) International on Saturday was good enough give the Joe Gibbs Racing driver the pole for Sunday’s Cheez-It 355. It’s Edwards’ second-career pole at The Glen and his fourth of the season. Kyle Larson was on the provisional pole before Edwards’ late attempt. When Edwards knocked Larson from atop the scoring pylon, Larson already was back on the track to improve his time. The late second attempt of the round was futile, though, as he remained second to Edwards. Although Larson was second in round two to claim a front-row starting spot, he was one of the culprits of a red flag that interrupted the first round of qualifying. Paul Menard spun and Larson slid in the grass in the first round, resulting in a red flag to allow track officials the opportunity to clean grass and mud from the racing surface. Tony Stewart qualified third and will share the second row with one of Joe Gibbs Racing teammates, Matt Kenseth. The other two JGR drivers, Kyle Busch and Denny Hamlin qualified fifth and sixth to share row three on the starting grid and give JGR four positions inside the top-six at Sunday’s green flag. “My teammates — they’re really fast,” Edwards said. Joey Logano’s 69.880-second/126.216 mph lap was the fastest of round one, but Logano wound up seventh in the second round, and therefore, will start seventh Sunday. Edwards was second to Logano in round one.